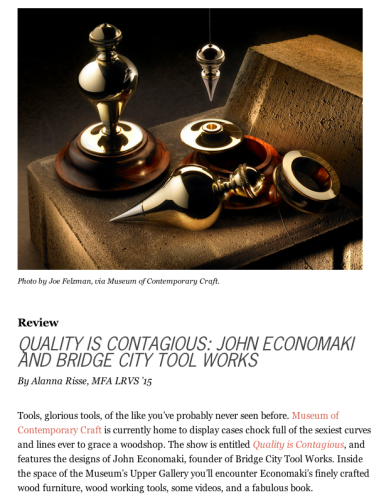 My article about “Quality is Contagious” at the Museum of Contemporary Craft is up on PNCA’s Untitled Magazine website. You probably won’t find John Economaki’s precision woodworking tools in your parent’s rusty tool shed. These beauties are works of art in and of themselves. But it’s odd to think that such creations might exist only through a bizarre twist of fate. In the 1970s and 80s, John Economaki was a skilled woodworker who’d thought he’d found his calling in fine furniture design and production, but who then had the rug pulled out from under him. After developing a severe allergy to wood dust, Economaki had to give up his medium of choice. After much soul searching, he went back to the drawing board and began rethinking the very tools he’d been using. Bridge City Tool Works was born. Economaki now applies the same intuitive design process to toolmaking that he learned through woodworking.